Susie Schaetzle instructs a class on how to paint a wooden snowman. 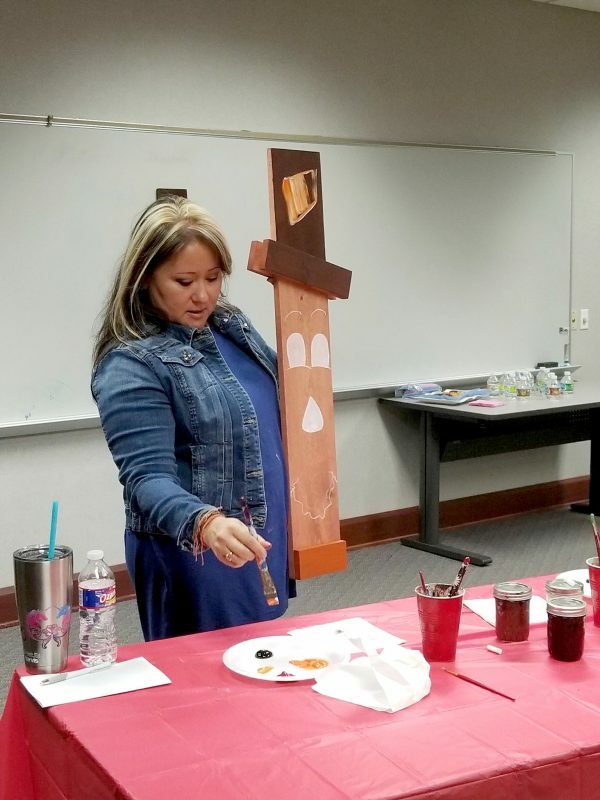 She enjoys teaching people to paint, even those who think they cannot even draw a stick figure. Besides teaching she also enjoys painting just for the pure love of it. She paints on a variety of canvases including shoes, saw blades and decks. A pet portrait done by Schaetzle. Unfortunately she burnt herself out on it and didn’t pick up a paint brush for 20 years. After moving to the Bourbon area to be closer to her father and meeting her husband, Andy, who had always lived in the area, she set down roots there as well. A friend wanted Schaetzle to throw a painting party for her daughter. Although Schaetzle did not feel as if she really wanted to do it, she begrudgingly agreed. This was when she realized she had fun painting again and she began to have public painting parties. Create-Ur-Canvas thus began in November 2014. A public painting party can be done with a variety of people in different places. She has held parties at Bremen Public Library, Bourbon Public Library, Warsaw Community Public Library, Wire and Steam, Warsaw, and Journey’s End, Bourbon. Painting parties can be held with youth groups, ladies groups and even as part of a Christmas party. Private parties are also a possibility. Schaetzle will come to your home for birthday parties for individuals ages 5 and up, anniversaries, employee development, bridal parties, couples parties, holidays and fundraisers. “My hobby has just exploded,” commented Schaetzle. She is working to focus her time more on paintings and projects she enjoys doing. For instance, her daughter asked for a painted pair of shoes. Schaetzle decided to give it a try and she is now selling shoes. “No two pair are alike, though,” she emphasized. 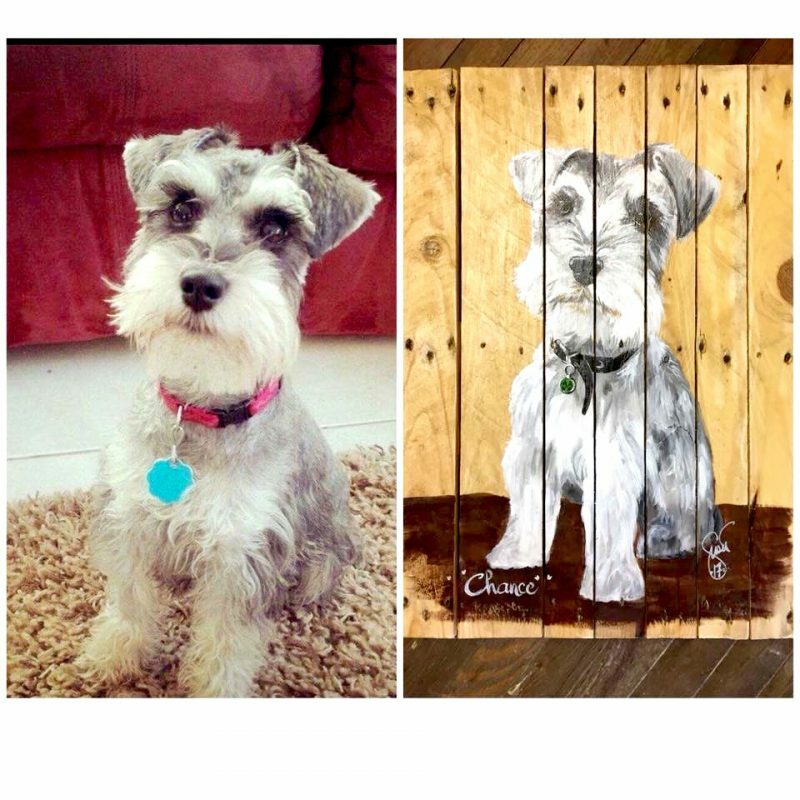 Besides shoes she has also painted saw blades, artwork, pets on canvas or pallets, decks and fences seasonally and murals. 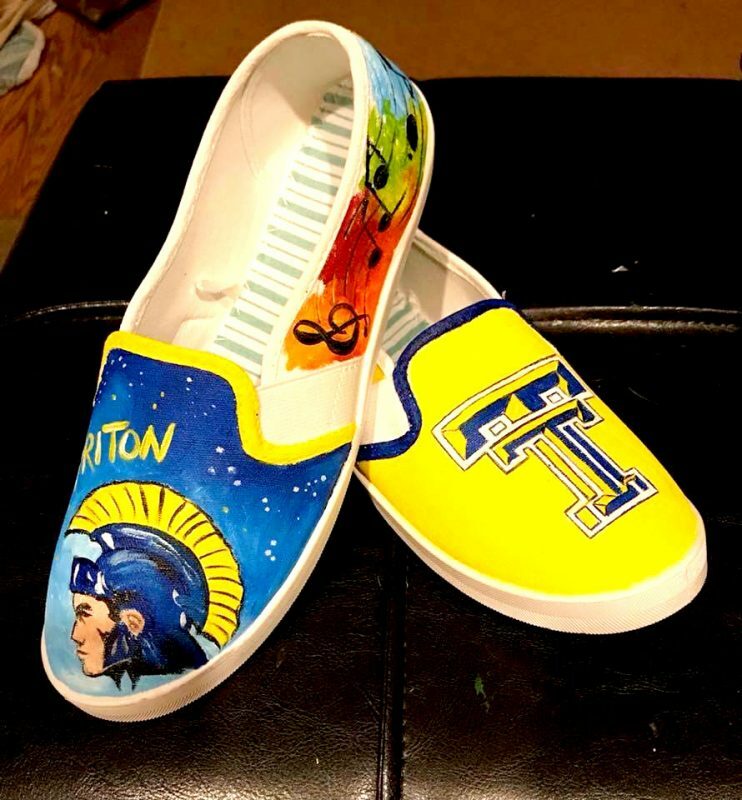 A pair of shoes showing Triton School pride designed and painted by Schaetzle. Schaetzle also sets up her work at the Bourbon Food Truck Friday events and can be seen every Saturday at the Warsaw farmers market. Here she sells the items she enjoys spending time on. “I grew up in that kind of thing,” Schaetzle explained. As a child she would frequently spend the summer setting up at various craft shows inside malls. Also a teacher at heart, Schaetzle not only teaches painting but she is also a substitute teacher at Triton Elementary School. This summer she is also acting as the art teacher for the Bremen Missionary Church art camp. When it comes to teaching painting, “It’s not about me, it’s about them,” she mentioned. She prefers simply to instruct and watch and tries to physically help on the piece very little. To her it’s all about showcasing the person and what they accomplished. When she’s not painting or teaching, Schaetzle enjoys gardening and working on her house. She has four children: Jonathan, Chrissy, Cody and William. For more information visit www.createurcanvas.com or visit the Createyourcanvas Facebook page.